While conducting research on the Mexican mushroom species during the 1950s, R. Heim and R. Cailleux determined the basic conditions essential to the cultivation of various mushrooms. Before providing additional details, I would like to briefly summarize the nutritional requirements and characteristics of fungal growth, to the extent that these issues are of interest here. In terms of cultivation parameters and nutrients, the psychotropic species are no different from table mushrooms and other common gilled mushrooms. For that reason, Oss and Oeric's speculations about extra-terrestrial origins of these species clearly belong into the realm of fables. In addition, psilocybin and psilocin are substances that can be derived from tryptophan by means of discernable reactions; indeed, the amino acid tryptophan in its free form has been found in a large number of mushroom species. The natural propagation of higher mushrooms is linked to their basidiospores, which are produced on the gills of developing fruiting bodies and which are eventually cast off. Once the spores have been dispersed - by the wind, for example - they will germinate when conditions are favorable (nutrients, temperature, moisture, lack of competing organisms) and finally, they gradually colonize available substrates. Initially, a monokaryotic mycelial thread (i.e. a mycelium with only one nucleus per cell) grows out of the spore and superficially penetrates the nutrient substrate. When two of these hyphae meet, they form a mycelium with two nuclei, or a dikaryotic mycelium ("mycelial network"). Later on, these mycelial strands go on to differentiate into sporeproducing fruiting bodies ("fruiting"). Eventually, their spores disperse and germinate once again. During most parts of the year, the dikaryotic mycelium grows unnoticed in its natural substrate and remains purely vegetative, that is, it continues to spread and to utilize new nutritional resources without producing mushrooms, provided there is sufficient moisture and temperatures do not drop below freezing. ln its dormant state, the mycelium can weather droughts and the cold temperatures of winter, only to begin to grow anew. Some species have mycelia with thick strands that are visible within the substrate (e.g. the rhizomorphs of Psilocybe cyanescens), while other species, such as Psilocybe semilanceata, develop comparatively thin strands that are hardly visible at all. Every mushroom collector knows that there are years of maximum mushroom yields. Other years, mushrooms are scarce and dry periods may pass with no apparent crops of gilled mushrooms or boletes. For the majority of mushroom species, the specific conditions required to reach the fruiting phase have not yet been determined. 1) Decrease of the temperature until time of optimal fruiting. 2) Increase of the humidity to 95-100%. 3) Decrease of carbon dioxide concentration through increased air circulation. 4) Exposure to light may be necessary for fruiting. Nature, but often need to be specially created for mushroom cultivation inside glass containers or enclosed rooms. It is no coincidence that the saprophytic species almost always fruit during the fall. Plant substrates such as twigs and leaves fall to the ground during this time and they are immediately colonized by available mycelia from mushroom spores as part of the natural cycle. The concurrent drop in temperature and increase in humidity are preconditions for fruiting. The proverbial rapid growth of mushrooms "overnight" is a function of mycelia that have previously massed together into knots, followed by a differentiation process into primordia, with progressive divisions into caps and stems. The whole mushroom is then ready to develop very rapidly, given sufficient moisture and ideal temperatures. Figure 42 illustrates a comparable in-vitro fruiting process that took about a week, with mycelia from Psilocybe cubensis (Earle) on an agar substrate. Artificial cultivation is an attempt to imitate and optimize the natural conditions essential for mushroom growth, and may even result in the discovery of additional nutrient substrates on which these species cannot grow in Nature. From the outset, this method of cultivation requires a sterile environment, in order to eliminate often fast-growing organisms such as bacteria and molds. For this purpose, laminar flow hoods are used in mycological laboratories. A small sterile space is created inside these containers by installing a filtration system that removes germs from a stream of air. The sterile space is used for the performance of tasks such as isolation of strains, and the production of sterile cultures and spawn for fruiting experiments. Antibiotics such as gentamycin (0.01%) are often added to the nutrient media, especially in the early stages of this process. Two methods are used to produce sterile cultures of fungal mycelia. The first method mimicks the mushrooms' natural reproductive process. Spores that fell off or were removed from the gills are suspended in sterile water. With microscopic control procedures in place, the spore solution is germinated on nutrients of various compositions that have been thickened with agar. One commonly used nutrient medium contains 3-6 malt extract along with 1.5% agar. 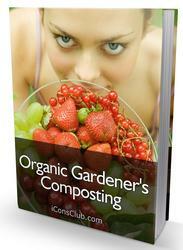 It induces spores from many different species to germinate in a matter of several days. Prior to germination, all substrates are placed in autoclaves and sterilized with steam. The simultaneous germination of a large number of spores will result in the growth of monokaryotic mycelia which spontaneously combine and go on to form dikaryotic mycelia. Alternatively, one can attempt to systematically fuse selected monokaryotic strands in order to develop vigorous strains for cultivation (criteria: rapid growth, high yield). This is a standard technique that is widely used in the cultivation of champignons (Agaricus bisporus). At the same time, such cross-breeding experiments enable the grower to determine whether mushrooms from different locations belong to the same species. Using this method, I was able to establish that mycelia obtained from Psilocybe bohemica and from Psilocybe cyanescens (collected in the U.S.) can never be fused together, which means that these two mushrooms are not of the same species. The second method of cultivation requires cutting a piece of tissue from the inside of young, unopened fruiting bodies, using a disinfected knife in a sterile environment. The piece of tissue is then placed onto nutrient agar medium. In most cases, visible mycelial growth will occur within a few days. This method has the advantage of all mycelia being genetically identical to the mushroom from which they originated, unlike mycelia grown from spore samples. Therefore, this method makes it easy for the grower to reproduce high yield strains of saprophytic species. Some wild strains obtained from various species do not fruit at all when cultivated, or else, they do so very late, with a yield of fruiting bodies that is sparse at best. Figure 42 - One-week growth progression of Psilocybe cubensis cultivated on a malt agar (2%) substrate. succeeded at growing fruiting bodies of the species Psilocybe mexicana, using compost substrate as a medium. This type of substrate is the most widely used nutrient soil for commercial mushroom cultivation (champignons). The fruiting bodies grown by Heim and Cailleux provided the dried material that A. Hofmann and his collaborators used to isolate psilocybin and psilocin for the first time. In Basel, it was also possible to cultivate mycelia from different species on liquid solutions of malt extract. The mycelial tissue was found to produce psilocybin without having to go through the fruiting process. This important discovery became the basis for harvesting large amounts of alkaloids. 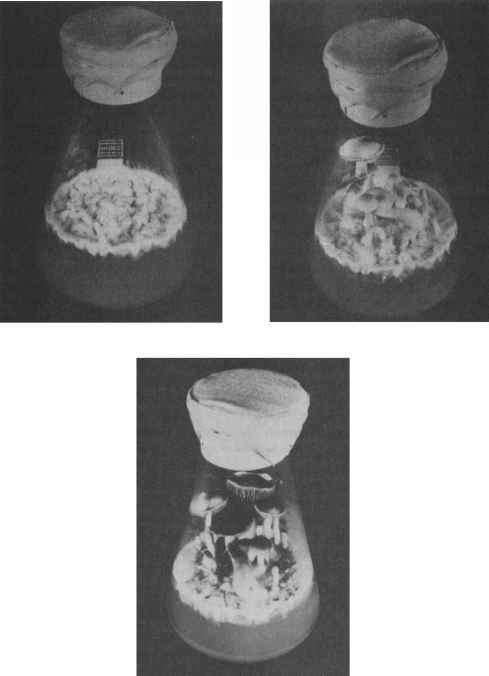 Unlike the fruiting process, which yielded five harvests over the course of several months, a species' mycelial cultures produced much larger amounts of mushroom tissue in only four weeks (see Figure 41). The cultures were grown on stationary malt extract (4-6%) with 0.2% agar added for increased viscosity. This kind of saprophytic surface cultivation can be easily adapted for growing species which are difficult to fruit under in-vitro conditions, such as Psilocybe zapotecorum Heim, permitting cultivation of these species for alkaloid production. Even though the mycelial tissue grown from the Mexican species contained only half as much psilocybin (0.1-0.2% of dry weight) as the mushrooms did, high yields (approximately 20g/1) along with easy and rapid cultivation of mycelial tissue more than compensated for the lower psilocybin content. It is interesting to note that mycelia from the North American species of Psilocybe cyanescens will turn blue and accumulate psilocybin when grown on a medium of solid malt agar, while both of these traits disappear completely when the same strain is cultivated on the type of liquid medium described above, even if levels of nutrients are identical. The reasons for this inconsistency remain a mystery. When mycelial cultures are kept in the dark, the mycelial forms may become partially permanent (sclerotia). Sclerotia may be hardened, are largely dark to black in color and they contain psilocybin as well. The formation of sclerotia was initially observed as part of the firstever attempt to cultivate psychotropic mushrooms on an agar medium. In 1935, H.J. Brodie reported permanent formations of bluish-green tissue while cultivating Panaeolus subbalteatus on malt agar. Initially, he believed that his nutrient substrates had been contaminated by molds, because Panaeolus subbalteatus is a species that almost never spontaneously turns bluish-green. Figure 47 shows a distinct sclerotia formation of the species Psilocybe semilanceata. The formation of these permanent structures with Conocybe cyanopus has been described in a previous chapter (see Figure 35, p. 57). Heim and Cailleux primarily described the fruiting of Psilocybe mexicana and Psilocybe cubensis on agar (0.05-2% malt extract) and on compost. During their experiments, Psilocybe mexicana produced the highest yields, while Psilocybe cubensis fruited quite vigorously as well. At about the same time, R. Singer had also started mycelial cultures derived from six mushroom species. Singer and his co-workers soon concentrated on Psilocybe cubensis in their efforts to induce fruiting. Soon after, in the early 1960s, R. L. Kneebone reported that this robust mushroom species, which thrives across subtropical climate zones, can also be induced to fruit on a rye-grain medium. In the mid-1960s, Psilocybe cubensis became the species of choice for experiments that made use of submersed fermentation to investigate the biosynthesis of psilocybin from tryptophan and other precursors. We should note in this context that around the same time, this technique was also used to obtain mycelial pellets of the species Psilocybe baeocystis Singer & Smith, providing the material for the first-ever isolation of baeocystin from mushroom tissue. From the 1970s on, a growing number of books were published in the United States that distributed information acquired by members of the counter-culture on the cultivation of psychotropic mushrooms. The scope of these books soon narrowed, with a primary emphasis on Psilocybe cubensis, which may be explained by the fact that, initially, only R. Heim's research results were published, thus making them available to a larger audience. In 1971, new results were published about the champignon's ability to fruit on a rye-grain medium, provided a cover layer was added on top. It wasn't long before these findings were applied to the cultivation of Psilocybe species. 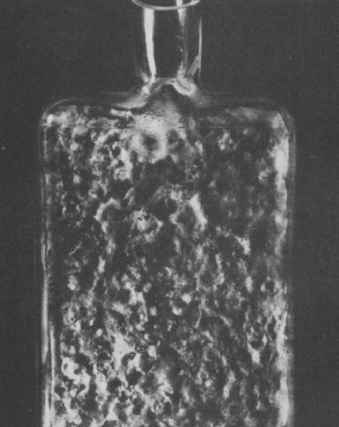 By 1932, J. Sinden had already published a patent for a cultivation process that involved the inoculation of mushroom mycelia derived from champignons into horse dung compost (a medium widely used for cultivation purposes) but only after the mycelia had already grown to permeate a medium of sterilized grains. Since that time, this process has mainly been used in the production of table mushrooms, specifically, for manufacturing the spawn to be placed onto the compost without inducing fruiting on grain. Psilocybe cubensis fruits after about three to eight weeks on this substrate. If a moist cover layer is added (e.g. a peat moss/lime mixture, 2:1), the yields may double. However, this process is risky, because over-saturation can render the containers nonsterile and invite contamination from bacteria and molds. Most authors prefer a mixture of rye and water that has been inoculated with mycelia from an agar culture. Still, rice, barley, wheat and other grains have also been used with varying degrees of success. Figure 52 shows that, after about five weeks, small mushrooms even grew on wet pages of a newspaper that used to be the official print medium controlled by the former East Germany's SED Party ("Sozialistische Einheitspartei Deutschlands" or "Unified Socialist Party of Germany"). Today, Psilocybe cubensis is clearly one of the most easily cultivated mushroom species around and it can thrive on a large variety of substrates. Naturally occurring specimens are most often found growing on cow dung. Generally, the species tends to grow on dung and straw as a primary decomposer, but the mushrooms can also utilize nutrients previously converted by other organisms, such as various types of compost, among others (see Figure 53, p. 77). Within the scope of this book, it is impossible to discuss all details pertaining to the fruiting process of psychotropic mushroom species. P. Stamets and J.S. Chilton are the authors of two outstanding books that deal with all the technical and practical aspects of mushroom cultivation. The psychotropic species are included along with information about many kinds of culinary mushrooms. Still, I would like to make special note of the fact that Psilocybe cubensis cultures benefit when horse or cow dung is added to the original nutrient mixtures, as evidenced by the mushrooms' relatively faster growth rate and the development of comparatively more robust specimens (see Figure 45, p. 71 and Figure 49, p. 74). Before adding the dung to the nutrient mixture, however, it must first be suspended in water and autoclaved, which considerably reduces the risk of contamination. Only then should the suspension be added to the rye grain substrate and sterilized once more. In spite of numerous claims in the popular literature, most attempts by laypersons to cultivate fruiting bodies of Psilocybe cubensis on rye grain substrate are thwarted by the presence of contaminating agents such as bacteria and molds. Even though mushrooms are organisms that do not perform photosynthesis and thus are no longer thought of as plants, some mushroom species, including Psilocybe cubensis, are heliotropes, meaning they will grow toward stationary sources of light. All Psilocybe species examined to date require light to promote the biochemical process in the mycelia that will induce fruiting. Additional exposure to light is needed, if the fruiting bodies are to develop into normal shapes and produce spores. Apart from a series of interesting physiological experiments performed by E.R. Badham during the 1980s, there are a few other noteworthy substrates for cultivation of Psilocybe cubensis fruiting bodies. For instance, we were the first to discover that a new type of plant hormone (brassinosteroids) will accelerate fruiting of the mycelia (Figure 40, p. 64). During these experiments, we were also able to completely suppress the formation of psilocybin and psilocin through high concentrations of phosphate. It is now possible to design future physiological experiments to study different hallucinogenic mushroom species under these conditions. In recent years I have also succeeded at cultivating the European hallucinogenic mushroom species. Figure 45 - Psilocybe cubensis fruiting bodies grown an a mixture of cow manure and rice. Psilocybe semilanceata is a mushroom species whose mycelia grow at a significantly slower rate than the mycelia of Psilocybe cubensis, Gymnopilus purpuratus, Panaeolus subbalteatus and Psilocybe bohemica. Despite the fact that only a few strains of Psilocybe semilanceata actually fruited, cultivation of this species succeeded with different substrates. 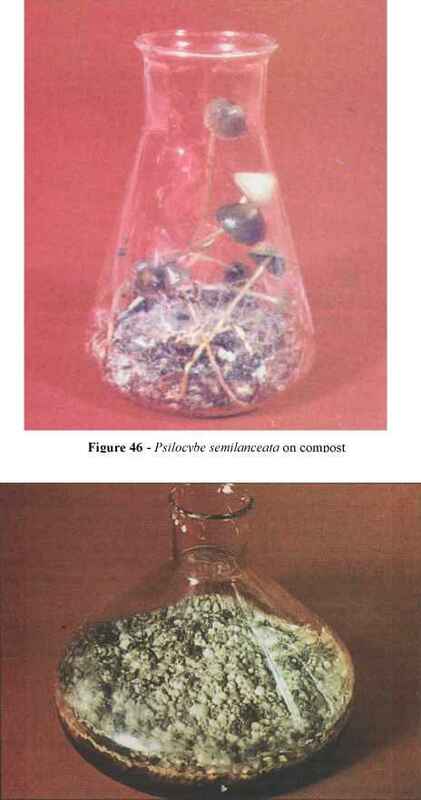 After a mycelial growth period of three to four months, the mushrooms emerged on compost (see Figure 46) as well as on a mixture consisting of grass seeds, dung, and rice (see Figure 66, p. 116). Four flushes of fruiting bodies were observed. Panaeolus subbalteatus also fruited after 92 days on a mixture of cow dung and damp rice. The physical appearance of these fruiting bodies differed considerably from specimens of the same species that had grown on naturally occurring substrates (Figure 3, p. 6 and Figure 51, p. 76). According to Stamets and Chilton, Panaeolus cyanescens is a species that does not fruit without a cover layer. However, this statement does not seem very plausible, considering the species can be found, much like Psilocybe cubensis, growing on top of dung under natural conditions. Psilocybe bohemica was another species that fruited on damp rice after two or three months. 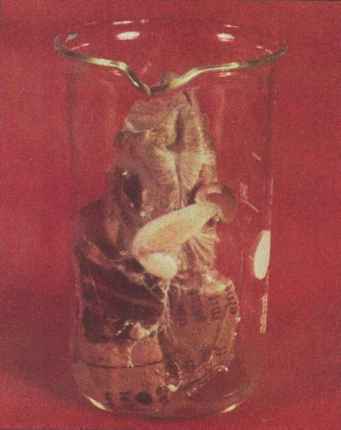 These in-vitro specimens also appeared to be much hardier in comparison to fruiting bodies collected at a natural location near Sazava, Bohemia (Czech Republic). The cultivated specimens even developed two (!) rings, yet these robust mushrooms did not fruit until after an exposure to the shock of cold temperatures (see Figure 44, p. 71). At about the same time, Gymnopilus purpuratus fruited on a moist mixture of rice and saw dust after six to eight weeks (see Figure 43, p. 71). 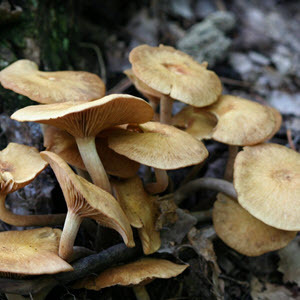 In this case, however, the cultivated mushrooms turned out to be smaller than fruiting bodies that developed from fruiting mycelia on wood shavings at a location outside the laboratory (Figure 30, p. 40). During the 1980s, there were also reports about success in cultivating psilocybin-containing sclerotia of Psilocybe mexicana and its close relative Psilocybe tampanensis Guzman & Pollock. In both cases, the sclerotia form after three to twelve weeks, preferably in the dark on a substrate of lolium (rye grass) seeds. All strains of Psilocybe tampanensis originate from a single fruiting body that was found near Tampa, Florida in 1977. Sclerotia from this species have also been cultivated on a straw substrate. Compared to lolium seeds, soft rice has the advantage of not drying out as fast, so that the sclerotia will form more evenly than they would on rye grass seeds. A photograph of Psilocybe tampanensis sclerotia is shown on page 117 (Figure 69). Psilocybe natalensis, which we first discovered in South Africa in January 1994 (see Chapter 7.6), is another species that easily fruits, within four to eight weeks, on compost or on straw with potting soil for a casing. In closing, I would like to comment on the mycorrhiza problem. Due to the close interrelationship between mushroom mycelia and their symbiotic partner trees, there exists a unique exchange of growth hormones and other products - substances whose study has only just begun. For this reason, all attempts to fruit these species in-vitro have remained unsuccessful. Nonetheless, we were able to start mycelial cultures from some of these species, but in most cases, growth rates remained very slow. As a result of my own investigations, I was able to isolate sterile cultures from Inocybe aeruginascens (see Figure 50, p. 75), which grew and developed greenish sclerotia at the same time. 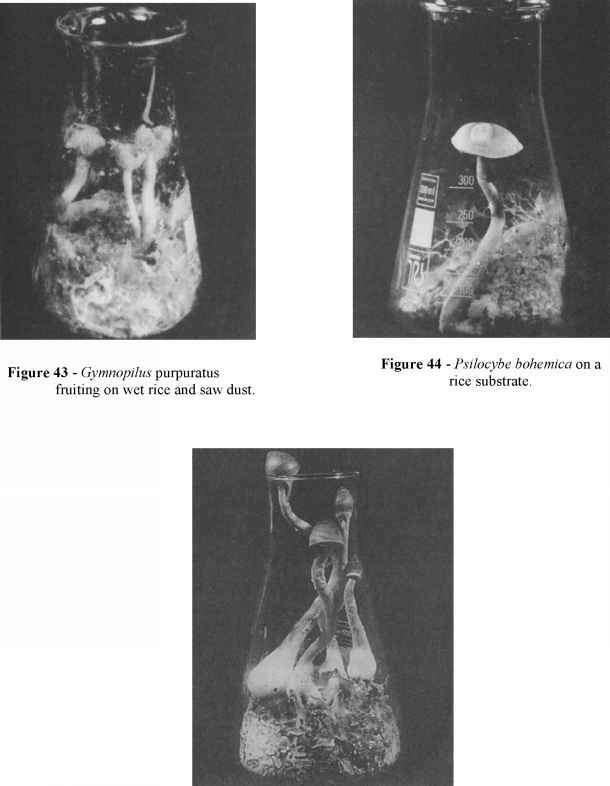 The dried mycelial mass contained about 0.1 % psilocybin, Figure 48 (p. 74) shows three Inocybe aeruginascens fruiting bodies whose mycelia grew naturally. 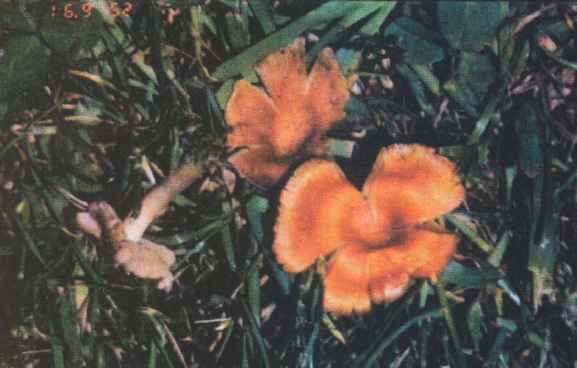 These mycelia were found to contain no baeocystin and less psilocybin (0.05%) than the fruiting bodies shown in Figure 48. Several months after these mycelia had been isolated from spores and fruiting body tissue samples, they began to degenerate and lost their ability to sustain growth, most likely because information available about conditions and requirements for optimal growth was insufficient. Figure 47 - Surface culture of Psilocybe semilanceata (with sclerotia formation). Figure 49 - Psilocybe cubensis on horse manure and rice. portions of mycelia whose texture is somewhat like wool. The kind of viruses known to appear in champignon cultures - where they have already caused a lot of damage - have so far not been found in cultures of the Psilocybe and Panaeolus species. It is safe to say that we currently know a great deal about the nutritional requirements of Psilocybe cubensis. To a lesser extent, such information is available about other species as well. Armed with this knowledge, future researchers may well discover new insights into physiology of these species, as well as the biochemical changes that occur during fruiting. Due to the relatively complex methodology and the type of equipment needed to isolate and maintain sterile cultures, it appears unlikely that cultivation of Psilocybe cubensis mushrooms by laypersons will significantly heighten the mushroom's popularity or widen its area of distribution anytime soon. However, since the early 1980s, growing numbers of mycophiles in North America and Europe have successfully used "natural outdoor cultivation" to fruit Psilocybe cyanescens and similar species. This process involves selection of natural wood substrates striated with mycelia (rhizomorphs) that usually turn blue in response to handling. The mycelia are then transferred onto fresh wood chips or commercial mulch (not from cedar trees). After several months of growth, the mycelia fruit during the fall season. 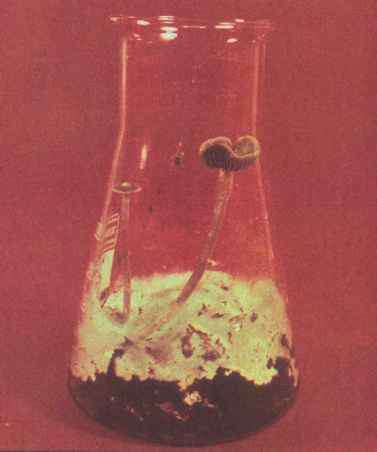 Figure 50 - Surface culture of Inocybe aeruginascens on a liquid nutrient medium. Figure Si - Panaeolus subbalteatus on cow dung and rice. 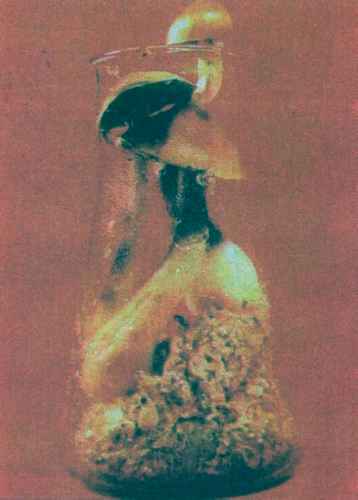 Figure 52 - Psilocybe cubensis on wet newspaper.